Hey everyone, first of all I want to say me, my family and friends are alive and doing ok. For those of you that don’t know, I live in Puerto Rico and we just went through Hurricane Irma and Hurricane Maria in a span of 2 weeks. In my house, we were without power for 10 days after Irma, got power back for 48 hours and lost it >24 hrs before Hurricane Maria. Needless to say it’s been a rough month of September. For those of you who are medical students, you know ERAS opens September 6th, the exact day Irma passed, and programs got access to applications September 15th. I tried to get as much done before that time but I wasn’t able to submit before the 15th. I lost power before I was able to submit so I ended up submitting using my phone data and hotspot. The other issue was Letters of Recommendation. All of my letter writers are in a part of the island that basically never got power either and as such I had no letters uploaded. After getting that out of the way we patiently waited for the hurricane to start and hoped it would not be as bad as was expected. I had lived 1 Category 2-3 hurricane back when I was about 6 years old, and several tropical storms. Irma had tropical storm winds with hurricane gusts and there were a lot of fallen trees. But this was a whole different story. Winds began to be felt at around 8:30pm steadily increasing. We had an extension from a neighbor who had power to turn on the ac for a few hours while we waited. At 1:30am power went out and the sound of the winds blowing was strong and scary. After this I gave up on sleep and we turned on the radio to stay on top of the information. Trees began to fall early on, and lots of weird noises and howling winds kept us on edge of what was happening. Slowly winds increased and radio stations began to fall off the air. There was a lot of rain, and a few hours that felt like 20 that the winds just kept hitting our home from the front and side. We felt when the zinc covers of our and the neighbors terrace kept flying off. 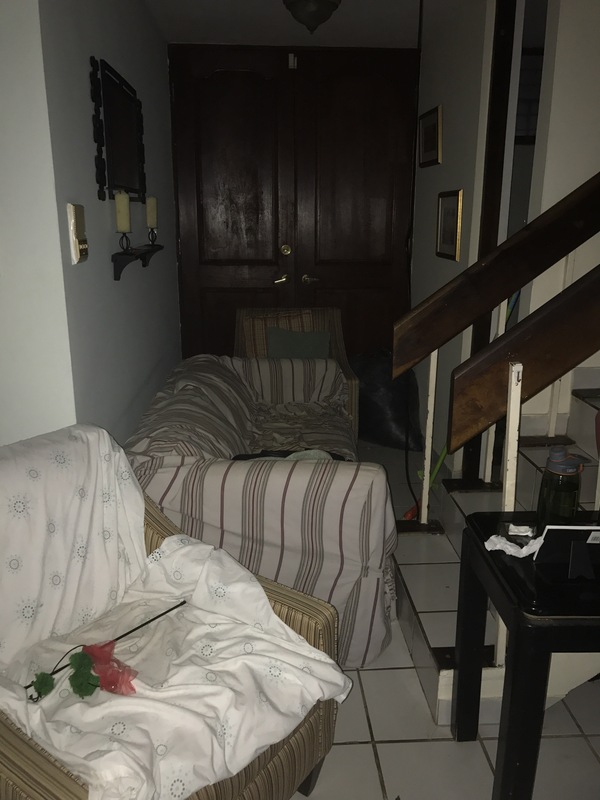 Hours passed and by 6 am we were running to keep the ac in the wall and my mom and hubby were putting the sofa against the door to keep it from bursting open. This my friends was the scariest few hours of my life. The sound of 165+mph wind gusts, the trembling windows and storm shutters that make you feel like they would be ripped off the wall. By 9 am winds had turned and things calmed down a bit because the direction of the wind had changed. I managed to crash, subduing to exhaustion for a few hours. I woke up around 2pm, still pouring heavy rain with strong winds to find my hubby and mom had cleaned the storm drain outside that had clogged up with debris from fallen trees and other stuff. After, he got to the roof to unclog drains, clean the roofs to get the water flowing and stop seepage into the homes. By 6pm most had subsided and the calm after the storm was finally here. Finally we could go to sleep and it was a chilly night grateful we were alive and had minor losses. Waking up Thursday, the sight was one right out of The Day After Tomorrow. Part 2 coming soon. I wanted to share my experience during this hurricane and bring you into what I’ve lived this past 2 weeks. For this obvious reason I have been off the grid completely since Sept 19th. I am eternally grateful for those that have lept up with me and have reached out. Hard times lie ahead but we will rise stronger than ever. I have limited access to inter and phone but it’s improved enough in the past 4 days that I could write this post. I’m honestly so relieved that you and your family are doing well. I can only imagine how scary it was, but glad you’re okay!